In this exclusive interview with Channels Television, Borno State government speaks on Nigeria’s restructuring and the activities of Boko Haram terrorists in the North East among other issues. Let me begin by having your take on the bill that was just signed into law by President Muhammadu Buhari; the North East Development Commission (NEDC) Bill. What’s your take on that bill? Well, it’s a very momentous bill which will turn out to be a game changer in the North East Development Equation because it will give us the platform of having a body charged with the responsibility of harmonising, regulating all the desperate bodies severing the same purpose – VSF, the PCNI, PINE, and so many other organisations that are serving the same purpose. So that will be the umbrella body that will drive the federal initiative, it’s a constitutional-recognised body that will have an appropriation from the National Assembly, that will have checks and balances while legislators will have the opportunity to ask questions, to identify priorities for the quality growth of our people. Don’t you think the NDDC is some sort of duplication of roles; we have the Presidential Initiative on the North East (PINE), we have the Victims Support Fund (VSF) and all other agencies that are taking care of similar roles as outlined in the details of that law? In fact, the existence of so many desperate bodies is the main reason why we should have the NDDC because all those committees were ad hoc bodies established and unfortunately pursuing similar goals. So the NEDC has come into being to harmonise all these desperate bodies so that collectively we can pursue our goal of the reconstruction and rehabilitation of the settlements in the North East sub-region. Do you think the South East, for example, deserves a similar initiative; a development commission? It will be insensitive on my part to say that the South East should be disenfranchised but it is never my wish or the wish of anybody from the North East for us to suffer the devastation, the destruction, the loss of lives and properties to warrant the establishment of the NEDC; NEDC is a child of circumstance because the North East sub-region has suffered fundamental neglect over the years – from 1979 up till date. You recently made a tour of some areas in Borno State, are you disturbed that some areas in the state are perhaps still under the stronghold of Boko Haram? Two and half years ago, the Boko Haram (terrorists) were holding sway in 20 out of 27 local government areas of the state. The Nigerian Army did a wonderful job, we have driven them out of all the local government areas of the state but the truth of the matter is that if anybody tells you that the Boko Haram has been completely wiped out, that person is economical with the truth. Mind you, Borno is the largest state in Nigeria in terms of land mass and the Boko Haram (terrorists) have made it into the hinterlands, unleashing their terror on helpless citizenry. Five or six Boko Haram will come and burn a village, kill as many people as they could and their prestige in the international jihadist community will rise. So these are nihilists, these are lunatics but otherwise, considerable progress has been made. They have been sufficiently decimated. But the United Nations report did disagree with the report of the government that Boko Haram no longer hold any territory because that report did say that three local governments are still under the control of Boko Haram in Borno State. Honestly, I disagree with the UN report because we have been on ground for quite some time, we are the sitting administration and we should be in a better position to tell the world the ground realities in the state. The Boko Haram are there in the Sambisa forest, I’m not disputing that fact; the Boko Haram are scattered in almost all parts of the state but that they no longer have the strength to hold on to any territory in the Federation of Nigeria. For now, I will allow almost all our people to go back to their communities except two local government areas where the peace is still fragile. Like in Abadam LGA, it is the military that is holding onto the town. But Abadam is not far off from the highland where the Boko Haram are residents. If we allow the people of Abadam to go back, for instance, the Boko Haram can easily come and infiltrate and get destruction on the people. So until those highlands are cleared of the remnants of the Boko Haram, the people of Marte, the people of Abadam will have to exercise some patience. But with all sense of responsibility, I’m telling you Abadam, Malam Fatori, Marte are in the firm grips of the federal troops. Some university lecturers were kidnapped and have been held hostage by the Boko Haram sect and there were demands; are all hopes lost on the rescue of these men? I believe discussions are currently ongoing; I will rather not comment on this issue so as not to jeopardise the lives of those hostages but I can assure you that discussions are ongoing and very soon they will regain their freedom. Do you want to become a president of Nigeria? I have never planned to be the governor of Borno State and for the presidency of this country, it’s a student of history. Nobody had ever aspired to be president of this country and got it. As popular as President Buhari is, with is bite-like grip among the Northern masses, on three occasions he couldn’t realise his dream. The fourth one, we literally (the governors, the party, the party leaders) dragged him to contest the 2015 election. Go down the memory lane, the Nigerian presidency doesn’t go for the person who runs after it. At any point in time, we should be grateful to God for opportunities given to us. 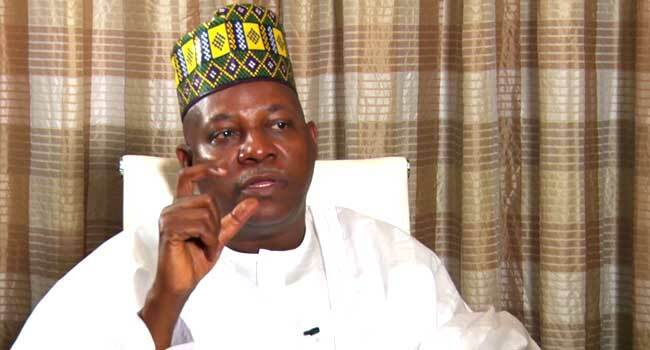 I became the governor of Borno State not because I am the most brilliant, not because of age, not because of my political sagacity, or pedigree, or intellectual accruement, is God in his infinite mercy and wisdom that decided to say that at this particular point in time, one young banker should be the governor of Borno State. So it’s not an obsession, it’s all about service, how we can move this country forward is much more important. You would have served two terms after the end of this term; that means you will be out of office. What would you be doing then? I have two or three things in mind; going to the Senate is an option but not an obsession for me. I want to go and do a Ph.D. I want to go back to the classroom … if you overstay your welcome in a party you will end up dancing with the cleaners and the cooks, so at a point in time it is absolutely essential if have an ordinary common sense to step aside and give others the chance to experiment with their own ideas. In 2019, do you think President Buhari should run (for presidency)? He’s a stabilising factor in this country; he’s a man of impeccable credentials, no matter what you will accuse Buhari of, nobody can accuse Buhari of corruption. But that decision should be made by the President, nobody should ask him not to contest, in the same vein nobody should push him to contest; he has his own health to take care of, he’s not a young man by any standard. If the nation still needs him and the nation truly needs the wisdom, the integrity, the commitment of the likes of Buhari. But believe me, whatever decision he takes, we are solidly behind him. The restructuring debate has been ongoing, do you think it is commonsensical or nonsensical at this time in our democratic life? My own take on this restructuring debate is that we are treating the symptoms, not the disease. Restructuring my foot, let’s restructure our minds, let’s restructure our quality of governance. When people are talking of artificial intelligence, when others are talking of robotics engineering, of nanotechnology, we are talking of restructuring the federation. Our problem is not an issue of devolution of powers, let’s be very honest. Our problem, as Chinua Achebe rightly encapsulated, is largely that of leadership. Leadership that will put the nation first is much more important than restructuring the nation. Let’s restructure our minds. Let’s restructure our quality of leadership. I attended a Government College Ughelli All Boys Association Colloquium yesterday where my very good friend, the governor of Bayelsa State (Seriake Dickson) made one revelation that the first boarding school in Bayelsa State was established in 2012. What is the population of Bayelsa? About one million people. How many local governments? Eight local governments. How much do they get in a month? Probably what Bayelsa gets in a month is what Adamawa gets in six months, is what Benue gets in seven months. Where have all those billions gone into, down the drain? So what is important is how we should restructure our own minds because we are divided with the piece of our hands in the pursuit of our individual goals but once the collective interests of the Nigerian elites are threatened, we become extremely united with the piece of our hands. So the problem of this country is the elites, we’ll manipulate every tendency be it religion, sectional, ethnic, in pursuance of our own individual goal. And why can’t militancy thrive in a climate of mere insanity, where no attention is paid to education?